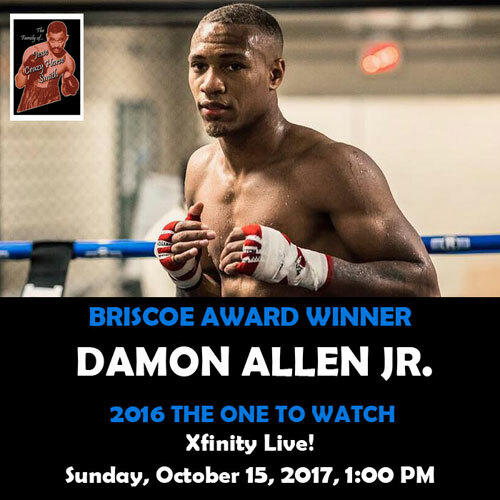 Rising Philadelphia lightweight Damon Allen Jr., 13-0-1, 5 KOs, will be honored as “The One to Watch” for the Philly fight scene, at the 10th Annual Briscoe Awards, on Sunday, October 15, 2017. Since his debut in 2013, Allen has been steadily rising in the lightweight division, and now finds himself on the brink of a major breakthrough. With Golden Boy as his promoter, and an impressive skill set in the ring, Allen is well-positioned to soon step into the spotlight. Allen's "One to Watch" award is sponsored by the family of Jesse Smith. The Briscoe Awards are named in honor of legendary Philly middleweight Bennie Briscoe and the trophies given away - the Briscoe Statue and the Briscoe Medal - all bear the deceased icon's likeness. The event brings together the local boxing community, including the award winners, their families, past and present boxers, fight fans, other boxing people, and general sports fans. This is the tenth year for the Briscoe Awards, which are presented by Philly Boxing History Inc., a 501(c)3 Non-Profit Organization, dedicated to preserving and celebrating Philadelphia's great boxing legacy. Past winners at the Briscoe Awards include Bernard Hopkins, Danny Garcia, Steve Cunningham, and many others. The event returns to Xfinity Live! Philadelphia, the central hub of Philly's sports stadiums, located at 1100 Pattison Avenue in South Philadelphia. Admission is $5, and tickets can be purchased at BriscoeAwards.com or by calling 609-377-6413. Everyone is welcome.